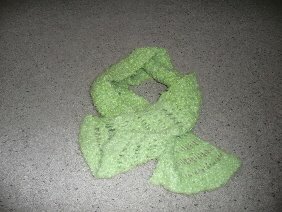 This is my first crochet project. I made this wrap 2 years ago for an event (themed green, of course) and I had fun with it. I used 2 different yarns – I don’t remember the brands now, but one had iridescent threads woven in it, and the other was very fuzzy, almost like cotton balls. Both were the same shade of apple green, and I had fun working with it. I thought I would share it in the spirit of the day. I am one of the 35 million Americans who claim Irish heritage, and I’m proud of it!